MOSCOW, December 31. /TASS/. The tragedy in the city of Magnitogorsk in Russia’s Urals, where a residential block collapsed as a result of explosion, took lives of four people. An official with the press service of the Ministry of Emergency Situations told TASS that two of the four bodies have been recovered from the debris. "During the search, only four bodies were found in the debris. At the moment, two of them have been recovered," said the official adding that now rescuers are trying to extract two more dead who remain in the debris. Earlier, the head of the Russian Emergencies Ministry Evgeny Zinichev said that the rescuers had found the bodies of three dead but could not recover them. The Emergency Situations Ministry specified that those three are among the four people who were found dead earlier. That means that the numbere of dead has not risen to seven as it was earlier reported. Sixteen people were evacuated. Several people were taken to hospitals. One of the hospitalized is in serious condition, he underwent surgery. According to the recent data, the fata of 35 residents including seven children remains unknown. According to the authorities, more than 1,100 people live in the house where the collapse occurred. About 110 residents were registered in the collapsed entrance, about 10 more rented apartments there. Some residents left for the New Year holidays and later contacted the authorities, saying that they were safe. Evacuated residents of the house are temporarily accommodated in the buildings of local schools, temporary accommodation centers can receive more than 1,400 people. 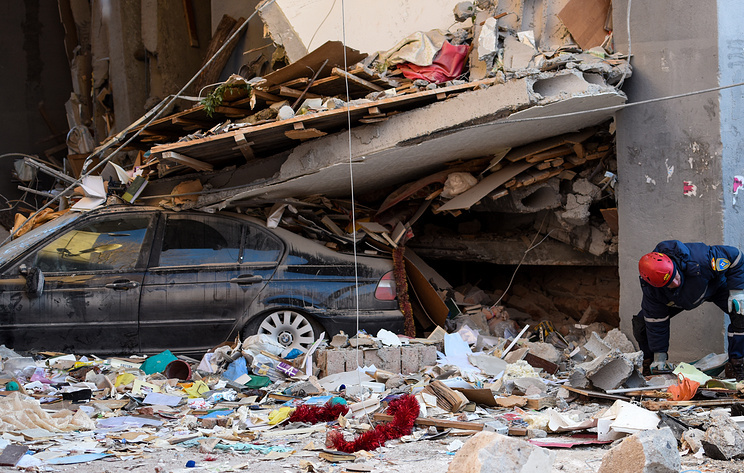 Rescuers continue to clean up the debris, hoping to find the survivors, but they the operation is complicated by low temperatures and the risk of collapse of the neighboring walls. As a result of the explosion the ceilings over one of the entrances in the center of the building collapsed. A criminal case has been initiated into the incident, and an emergency situation has been introduced throughout the Chelyabinsk Region. President Vladimir Putin promptly flew to Magnitogorsk, arrived at the scene of the tragedy. He held an operational meeting at the emergency ministry’s headquarters, which was deployed at the site of the incident. The president, in particular, ordered the creation of a government commission to eliminate the consequences of the explosion and involve all the related departments in this work. After the meeting, Putin inspected the house in which the explosion occurred. The head of state was accompanied by the governor of the Chelyabinsk region Boris Dubrovsky. The president also visited the local hospital where he visited a teenager, Sergei Gavrilov, who was found by rescuers under the debris. Putin talked to the boy and promised to give him a New Year's gift. The authorities are setting the date of mourning in the region. The governor of the Chelyabinsk region told reporters that the families of the victims would be paid 100,000 rubles each, while the affected tenants would be paid 50,000 rubles each. Those who lost their homes will be provided with new apartments. Dubrovsky said later that that the amount of financial aid could be increased. Currently, the city residents are bringing flowers to the scene of the tragedy, lighting candles in memory of the victims. The authorities asked residents of the city to refrain from making fireworks on the New Year night. President Vladimir Putin expressed his condolences to the families of those who died in the tragedy in Magnitogorsk. He also called on Russian citizens to remember the victims of the tragedy during the New Year’s Eve celebrations.